Brand New WOLFF "Twice as Sharp" Scissors & Shears Sharpening System with Training Video and Manual. Sharpens Fabric, Industrial and Household Scissors and Shears Quickly and Easily. Comes with Training Video and Manual. Sharpens 20 - 30 pairs of scissors per hour, no need to disassemble. Perfect for Professional & Mobile Sharpeners! Makes Scissors Sharper then New!!! Free floating arm system & sealed bearings provide years of maintenance free use. Eye shields, wheel covers and finger guards for safety. Honing wheel or standard buffing wheel produces shears 2 to 6 times sharper than new. Shears-Lock clamp opens wide for thick blades, self-adjusts for blade taper. 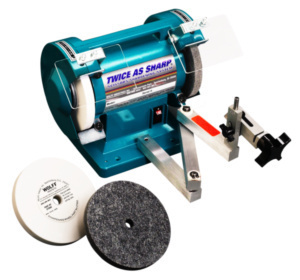 1/2" wide sharpening wheel, 100 grit friable aluminum oxide grain structure prevents burning. Clamping system adjusts from 0 to 55 degrees to match angles consistently. Comes with : Safety glasses, breathing mask, scissors lubricant, operators manual, pink hone, wheel dresser, eye shields, hex wrench, angle gage and training. Weight : Boxed 14 pounds. Unit 12 pounds. Voltage : 110V. 60 cycle. Wattage 375. Motor : 1/4 H.P. condenser run. Bearings : Precision ball bearings. Arms : Double sealed Rulon bearings®, no maintenance require.